Do you Want a pull up banner in your office, in a store or at an event? This portable advertising is an easy way to build brand awareness or share campaign information. You can have anything in your imagination but it takes experienced designers to put it to paper. That's where the team at Snap comes in. 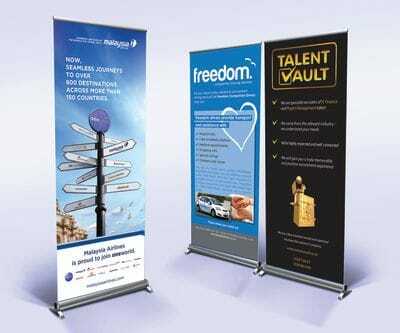 Our people have the expertise to design a pull up banner that's dynamic, eye catching and colourful. Standard Pull Up Banners are 850mm x 2000mm high and come with a stand and free carry bag. Other sizes and optional stand designs are available. We print and assemble so they are ready to go. What are the benefits of a pull up banner from Snap? To speak to someone about creating a stunning pull up banner, contact us now.